Officials are still trying to figure out just how three vehicles crashed, one badly, in a pounding rainstorm on Wednesday evening, January 16. 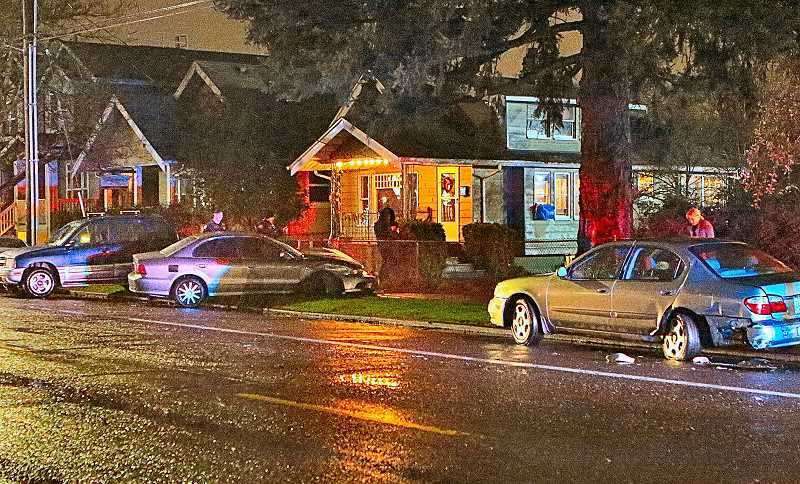 Four East Precinct cruisers were dispatched to what was described initially as an "injury accident" on S.E. Woodstock Boulevard just east of 55th, at 8:37 p.m. Woodstock Fire Station 25's Truck Company was also sent to the crash. Responders found a Chevrolet Tracker mini SUV pushed across the north sidewalk, facing south; a Mitsubishi sedan, also on the sidewalk, facing north with a smashed passenger windshield and very heavy front end damage; and an Infiniti J30, its rear axle broken, pushed partway up over the curb. According to an officer at the scene, it's believed that the Mitsubishi was westbound on Woodstock Boulevard when, for unknown reasons, it collided with the rear corner of the Infiniti, and then somehow smashed into the Chevy, turning it sideways. "No one was medically transported as a result of this crash," PPB Public Information Officer Sergeant Brad Yakots told THE BEE. "We do not have any other information as of now." The investigation continues.